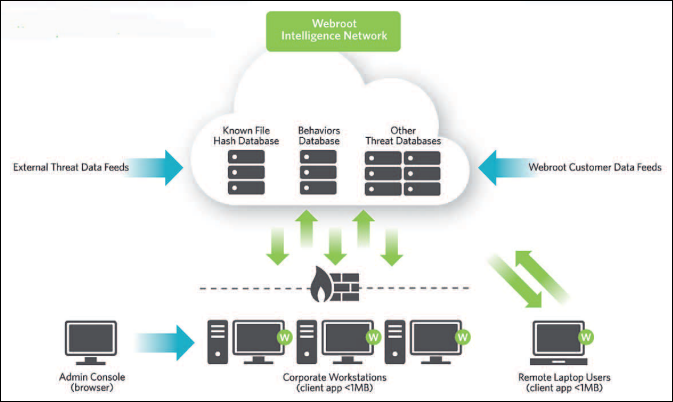 Webroot® SecureAnywhere™ Endpoint Protection secures your enterprise from malware and other threats by combining Webroot’s behavior recognition technology with cloud computing. Endpoint Protection includes a Management Portal, also called an Admin Console, which is a centralized website used to view and manage your endpoints. An endpoint can be any Windows corporate workstation, such as a PC, laptop, server, or virtual server. You can deploy SecureAnywhere software to these endpoints within seconds, protecting users immediately. Once SecureAnywhere runs a scan on the endpoints, it reports their status into the Management Portal. This user guide describes how administrators can deploy SecureAnywhere and use the Management Portal to view threat alerts, data charts, and other information about endpoint activity. The tasks you can perform depend on your access permissions and what mode of management you select during Endpoint Configuration. This guide is intended for administrators who are using Endpoint Protection with full access permissions.